Just Cats, Naturally is a feline-only house call practice that serves the Greater Washington DC Metropolitan area. Dr. Tasi utilizes classical homeopathy, nutritional therapy, and behavioral assessment. 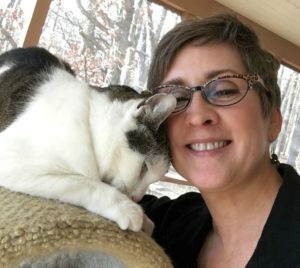 Her goal is to help healthy cats stay well and sick cats improve their health. She feels that an in-home assessment of your cat not only allows her to best understand your cat’s health in the context of his life circumstances, but also provides a less stressful experience for cat and guardian. Dr. Tasi takes a holistic approach to caring for your cat. During her first visit, Dr. Tasi gathers a comprehensive health history, which will not only include your cat’s physical health history, but also address her emotional and mental state. Dr. Tasi will then perform a thorough physical examination before discussing an appropriate treatment plan with you. Homeopathy is a gentle and effective modality that is especially helpful in addressing many chronic feline conditions, such as lower urinary tract disease, inflammatory bowel disease, asthma, and various issues related to normal aging. The goal of all of Dr. Tasi’s recommendations is to preserve and reinforce your bond with your cat. She will never advocate treatments that create undue stress or damage your relationship. Follow up care will take place by phone consultation or recheck house call, depending on your cat’s condition. A 1988 graduate of the University of Pennsylvania School of Veterinary Medicine, Dr. Tasi has been in feline-exclusive practices since 1991. Frustrated with the limitations of conventional medicine – especially in addressing chronic feline diseases like asthma, lower urinary tract disease, inflammatory bowel disease, etc. – she pursued training with Dr. Richard Pitcairn. After completing both the Professional and Advanced Courses in Veterinary Homeopathy between 2006-2008, Dr. Tasi opened Just Cats, Naturally in 2007. She is on the faculty of the Pitcairn Institute of Veterinary Homeopathy, the only veterinary homeopathy training program in the United States. Dr. Tasi lives in Northern Virginia with her husband, Roger Nicholas, and three cats. To schedule a house call appointment, please contact Dr. Tasi via email or call her at 703-440-3637. Dr. Tasi does not offer email or phone consultations. Copyright © 2019 Just Cats, Naturally – Designed & Developed by ZThemes.